I read all the reviews and then some more on youtube and online. I was very excited about them, but what a huge disappointment when they did coming. The frame is basically the cheap plastic stuff you get for $2 on a mall kiosk. The foam surrounding feels cheap as well. I end up going back to my sun glasses I got for my car. What a huge disappointment. Okay, so I got these with the purpose of fitting them with my prescription lenses. That did not work that well since my prescription is a little strong for the curve (at least for me). But they work well for my son at least. Interchangeable lenses are nice as is the ability to switch between the band and arms. The glasses were a bit wide for me to work very well, but as stated they worked okay for my son. I needed a pair of glasses that were both dark enough for the blazing Brisbane sun and i could wear at night without having to carry a second pair. I still have to carry a second pair. These became my night ones. The day lenses are definitely dark enough and with the 4 grades to choose from they will certainly meet all the needs, however the change out requires you to put your greasy fingers all over the lenses. I don't think i looked at the pictures properly before I bought these because I thought there was some sort of mystical finger avoiding lens module....... anyway. The lenses all pop in and out with a good amount of pressure, and feel pretty solid once in, I just think that if I did that change even once or twice a week I don't think they would last the year. I am using the amber lenses for night riding and keeping the darkest lenses in the bag in case i forget or lose my existing day ones. I couldn't really see me using the clear lenses for anything, amber at night seems to make things a lot clearer and road debris seems to stand out more. I have used them with the strap and with the arms and both are fine, but I prefer the arms because i can take the glasses off easier. Having said all that I am happy with these and would recommend with all the caveats I have mentioned. I bought these specifically for a pair of goggles to use at night with clear lenses. I had Lasik eye surgery so my eyes dry out much faster than average, and I wear a half-helmet when riding, so it is especially important to have a good pair of wind-blocking sun-glasses/goggles. I own a pair of Liberty Sport Deflectors, which are amazing during the day, but they are tinted and not viable for wearing during night-time. 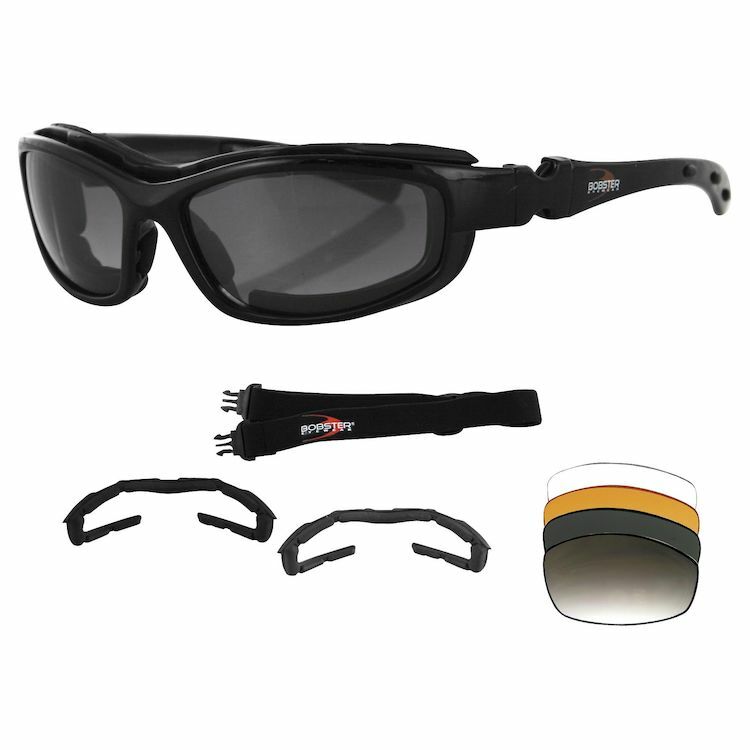 The Bobster Road Hog II Goggles are priced fairly high, but they come with four different lenses and goggle straps, along with the regular sunglass arms. Unfortunately, these don't block the wind very well at all, and are no better than wearing regular sunglasses. I am highly-dissatisfied with these and will likely not buy another Bobster brand product. Unfortunately, that means I also need to get rid of these ones, so I guess I will be craigslisting them! I've now had these glasses for a few months and I can honestly say that I love them. It's great to be able to switch lenses. I have a smaller face so they fit well on me. They look great and I use them as my primary pair of sunglasses as well. I will say for those of you looking for something that completely blocks out the sun, this doesn't do that. I've noticed that it has the tint so you can still distinguish color and time of day (I sometimes forget I'm wearing them), and it will darken everything but still let you enjoy how it looks. I don't notice the sun a whole lot but you will see some glare and will probably be squinting a little bit at rare times. Other than that great glasses and I completely recommend them. I primarily do city riding, and a few short journeys on the highway, and I needed a pair of specs to compliment my Bell Rogue helmet. The Road Hogs are versatile for all rides and styles. It comes with a bunch of lenses, so you will be able to switch it up seasonally. I hope they last for a few years, and if they do, I will grab another pair when my current ones kick the bucket. I also use them as my primary sunglasses. These glasses are very comfortable, but I have mixed feelings about them because the lenses aren't dark enough. They do come with a nice variety - clear, amber, and dark, but the dark ones just don't do enough for me. I felt like I still had to squint while I had them on. I'm saying I recommend them because they are nice glasses, and if you aren't concerned with the dark lenses you will enjoy them. these glasses are great at blocking wind, just what I wanted them for. The way the frame attaches to the foam surrounding could be a little sturdier (it pops out sometimes), but they are still fully functional and a great deal for the price. To start off, in my opinion Bobster is a great brand. They did however go a little bit too far with Road Hog II in the sense that there are too many parts. After purchasing them I realized that I would rather carry 2 pairs of sunglasses or goggles rather than switching between a darker lens during the day and a clear at night. As for fitment, in comparison with my other goggles (The Bobster Fat Boy) the temples on this goggle are too loose, and although the closed cell foam filling is comfortable it blocks a part of my vision - Could be the size of my head but I don't face that issue with the Bobster Fat Boy!